Fabulous morsels that are delicious hot or cold. 1. Cut the fillet into four to five smaller pieces. 2. 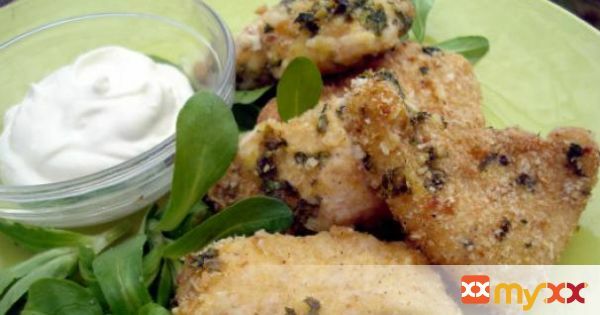 Mix and combine breadcrumbs, Parmesan and parsley in a shallow dish and season with salt and pepper. 3. Dip the chicken pieces into the beaten egg, then into the breadcrumb mixture. 4. Place in a single layer on a small baking sheet and chill in the refrigerator for at least 30 minutes or even overnight. 5. Meanwhile, make the garlic mayonnaise. Mix and combine all ingredients. Cover and chill until ready to serve. 6. Drizzle the butter over chicken pieces and cook in the oven at 180˚C for about 20 minutes, until crisp and golden. 7. Serve immediately with the garlic mayonnaise. 8. Easy suggestion: alternatively, cool the chicken, store in the refrigerator until required, and then serve at the room temperature with the garlic mayonnaise. Ideal for picnics.